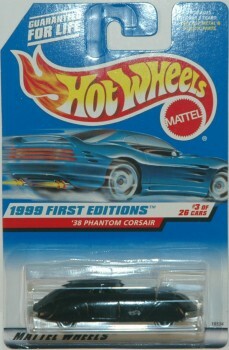 This Hot Wheels ’38 Phantom Corsair was released as part of the 1999 First Editions Series. Real Wheels: The Phantom Corsair is a prototype automobile built in 1938. It is a six-passenger 2-door sedan that was designed by Rust Heinz of the H. J. Heinz family and Maurice Schwartz of the Bohman & Schwartz (de) coachbuilding company in Pasadena, California. Although sometimes dismissed as a failure because it never entered production, the Corsair is regarded as ahead of its time because of its futuristic features, and styling cues such as flaired-in fenders and a low profile. Variations: YES – according to reference materials there are at least five variations of this series/model. Check out the books and guides we use as reference. This article uses material from the “’38 Phantom Corsair” article on the Hot Wheels wiki at Fandom and is licensed under the Creative Commons Attribution-Share Alike License. 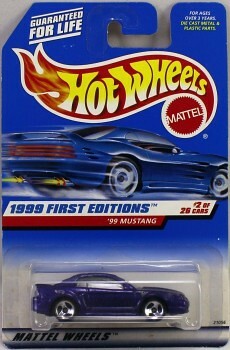 This Hot Wheels ’99 Mustang was released as part of the 1999 First Editions Series. Real Wheels:The ’99 Mustang is a “fourth generation” Ford Mustang produced by Ford for the 1994 through 2004 model years. For 1994 the Ford Mustang underwent its first major redesign in fifteen years. The design, code named “SN-95” by Ford, was based on an updated version of the Fox platform. It featured styling by Bud Magaldi that incorporated some stylistic elements from the classic Mustangs. A convertible returned, but the notchback and hatchback body styles used in earlier Mustangs were not available. Prior to the redesigned Mustang’s launch, a two-seater show car was designed by Darrell Behmer and Bud Magali. Called the Mustang Mach III, it was shown at the 1993 North American International Auto Show in Detroit and hinted at what the new production Mustang would look like. The Mach III featured a supercharged 4.6 L DOHC V8 with 450 hp (336 kW; 456 PS). While this engine was not put into production, it hinted to the future use of Ford’s Modular V8 in the Mustang, including the eventual use of a supercharged 4.6 L V8. Variations: YES – according to reference materials there are at least seven variations of this series/model; including multiple color, wheel and tampo variants. Check out the books and guides we use as reference. This article uses material from the “’99 Mustang” article on the Hot Wheels wiki at Fandom and is licensed under the Creative Commons Attribution-Share Alike License.